The Nevada State Athletic Commission has suspended eight contestants that fought in this past weekend’s “The Ultimate Fighter 9 Finale” event in Las Vegas. Following his controversial split decision loss to Diego Sanchez, main event fighter Clay Guida will be sidelined until August 15th for precautionary reasons. Jason Dent: Orthopedic doctor must clear right knee, otherwise he’s suspended until July 21st with no contact until July 12th. Frank Lester: Suspended until July 21st with no contact until July 12th for precautionary reasons. Mike Ciesnolevicz: Suspended until July 21st with no contact until July 12th for precautionary reasons. Brad Blackburn: Orthopedic doctor must clear right shoulder, otherwise suspended until December 18th. Suspended until August 15th with no contact until July 21st for precautionary reasons. Edgar Garcia: Suspended until July 21st with no contact until July 12th due to a right-eyebrow cut. Andre Winner: Suspended until July 21st with no contact until July 12th due to a left-cheek laceration. Kevin Burns: Doctor must clear right hand, otherwise, suspended until December 18th. Suspended until August 15th with no contact until July 21st for precautionary reasons. 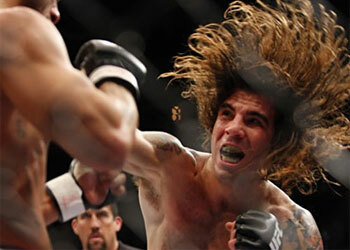 Clay Guida: Suspended until August 15th with no contact during training until July 21st for precautionary reasons. TUF 9 took place inside The Pearl at The Palms Hotel & Resort this past Saturday.